Boeing was making a running of commercial deals at all major aviation events this year, but Airbus is finally outpacing its US rival. The French manufacturer has just announced striking a deal with Indigo Partners for 430 planes, to be distributed among four airlines. 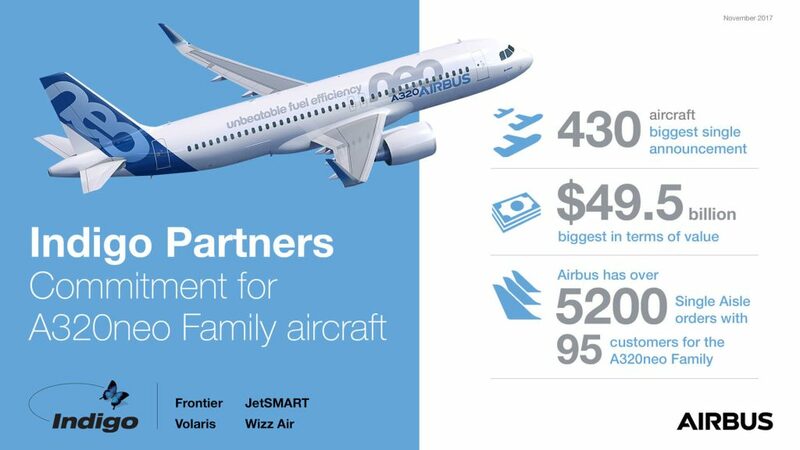 Valued at $49.5 billion, this is Airbus’ largest single announcement ever. Airbus and Indigo Partners have signed a Memorandum of Understanding at the Dubai Airshow 2017 for the purchase of 430 A320neo family aircraft. The commitment is comprised of 273 A320neos and 157 A321neos worth $49.5 billion at list prices. Upon the completion of final purchase agreements, the aircraft will be allocated among four ultra-low-cost airlines in Indigo Partners portfolio: Frontier Airlines (United States), JetSMART (Chile), Volaris (Mexico) and Wizz Air (Hungary). Indigo Partners’ Bill Franke indicated that engine selections will be made and announced at a later date. Indigo Partners, based in Phoenix, Arizona, is a private equity fund focused on worldwide investments in air transportation.